In Afghanistan, A Struggle To Stem Deaths From 'Insider Attacks' : The Two-Way America's top general is in Afghanistan, in part to discuss how to stop the "green on blue" attacks that have left 10 U.S. military personnel dead in just the past two weeks. One step that's already been taken: Armed coalition soldiers are now watching their Afghan counterparts during missions. 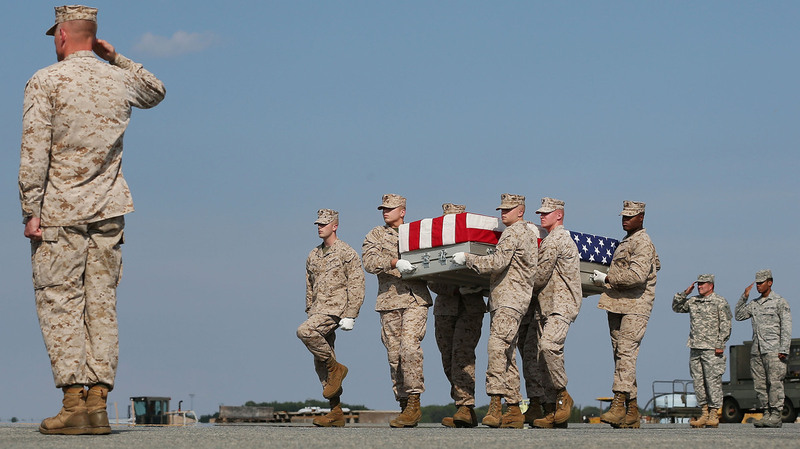 Aug. 13: At Dover Air Force Base in Delaware, the remains of Marine Lance Cpl. Gregory T. Buckley are carried during a dignified transfer. He was killed in a "green on blue" attack. The killing Sunday in Afghanistan of an American soldier in what officials say was the latest in a series of "green on blue" attacks by Afghans in uniform against coalition personnel was the 10th in just the past two weeks. There have been "30 such attacks so far this year, up from 11 in 2011," The Associated Press writes. Those grim notes underscore how serious the discussions will be today as the top U.S. military commander — chairman of the Joint Chiefs of Staff Gen. Martin Dempsey — meets in Afghanistan with officials there to discuss how to stop such "insider attacks." " 'The vulnerability of local police to (terrorist) influence is great ... They don't move around the country the way the Army does, so they live at the point of corruption. I'm sure that's the case here too,' Dempsey said.
" 'Are the local police more vulnerable to those kind of activities? Absolutely,' he said." As American and other coalition personnel are increasingly involved in training Afghan soldiers and police to take over security, they're increasingly at risk if the recruits aren't properly vetted. On Morning Edition, NPR's Soraya Sarhaddi Nelson talked with host David Greene about what American and coalition forces are doing to try to protect their personnel. The steps include placing "guardian angels" — armed coalition soldiers — in mess halls, gyms and other areas to watch over other personnel. Coalition troops have been ordered to keep their loaded weapons at hand. When they're training Afghans, other coalition personnel will also be watching the recruits. And "one or more armed soldiers" are now monitoring Afghan personnel "during any joint meeting or mission," Soraya said. But it is not easy to spot and turn away those Afghans who want to infiltrate the nation's army or police, Soraya added, in part because it can be difficult to determine their motivations. Some who have carried out the attacks may have had personal disputes with coalition forces. Others likely had battle fatigue. And some were at least influenced by extremists from the Taliban or other groups. Then there are those such as the 15-year-old Afghan who officials say killed three U.S. Marines earlier this month in southern Afghanistan. His background was never investigated before he had access to a U.S. base. The Washington Post wrote Friday about the teen, who had never been vetted but was allowed on a military base because he was the "unpaid, underage personnel assistant of the district police chief." "Aynoddin [the teen] should never have been on the base in the first place, because Afghan and U.S. security standards would not have allowed it. But those standards are often violated — especially by the country's nascent police force." Once there, he apparently watched and waited until an opportunity arose to steal a weapon and turn it on the Marines as they were exercising in a gym. "I just did jihad," Aynoddin said after the attack, the Post writes, citing as its sources "several men who were on the scene."